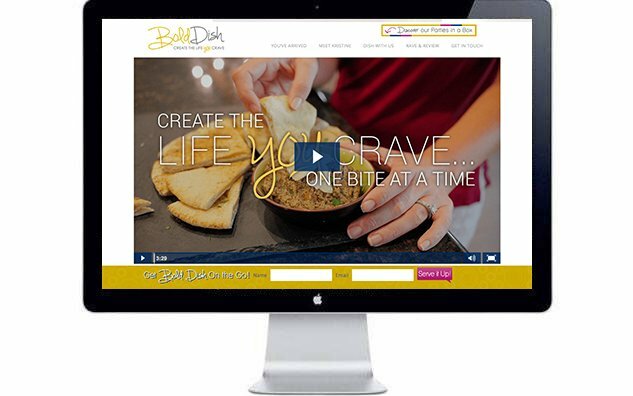 If there’s one theme you’ll see again and again throughout my website, is a deep and sincere love of food and cooking. Having grown up a picky eater with many dinner table stand-offs (sorry, Mom!) you could say I rediscovered food in my mid-20’s and never looked back. 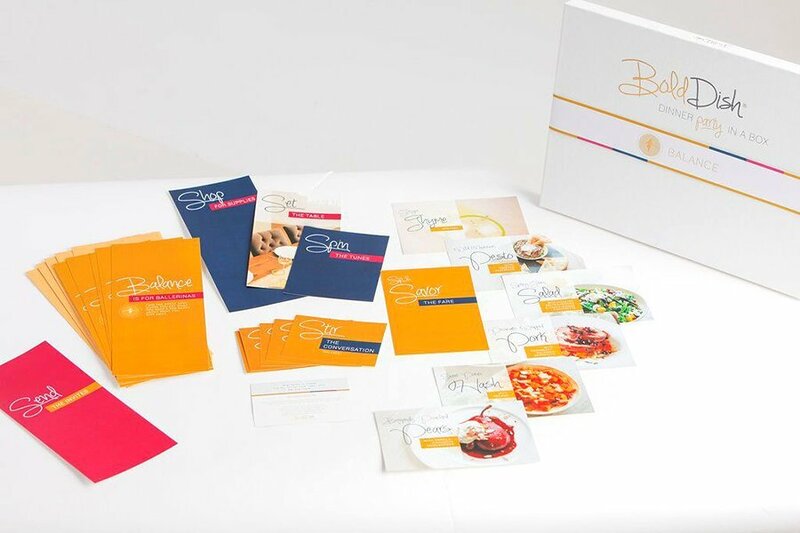 When Kristine contacted me, she’d recently rebranded her former coaching business and was looking to launch Dinner Party in a Box, her new product that would include everything you’d possibly need to host a killer dinner party filled with not only great food and fun, but a deeper and more meaningful connection with your friends. 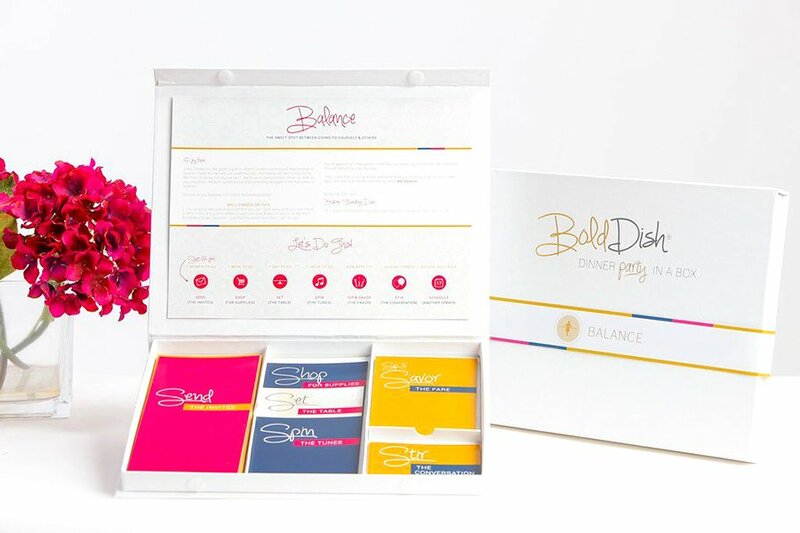 The box includes invitations, gourmet recipes, a playlist, a shopping list, tablescape ideas and conversation cards set around a theme to get guests talking about things that truly matter. In short, Dinner Party in a Box is like a life coach, personal chef, and event planner whipped up the perfect girls night in! She’d been working with a Designer for a couple years, however, she’d been feeling like the maturity of the branding and design wasn’t quite where she wanted it to be just yet. She had a solid logo, typefaces, patterns and color palettes established, but wanted it all kicked up a notch and carried over into her new product and materials. Though she liked and had been using her existing logo, Kristine wanted more of an illustrated graphic, or mark, to encapsulate her brand and give her more options where appropriate. We kept the original font and tagline, but created a plate/talk bubble graphic to convey the dual meaning “Dish” as a plate, and as gossip/talking. The highlight of the plate double as forks and happy excitement dots radiate from the graphic. Next, we translated the brand standard into the packaging design. It was important that the package was designed in such a way, using high-quality materials, that it was just as important as the product inside and the experience one has while using it. The box and materials needed to be something that women are beyond excited to get, excited to open up and excited to use. Whether someone gives it to them or they buy it for themselves, it should feel like a special “gift” just for them and something they can’t wait to share with their girlfriends. By using thick paper stocks, gold foil accents and a high-quality linen box, the whole product oozes with luxury and feels like a gift for the soul. Next was the website design. We had the logo and packaging solidified, now she just needed a cohesive way to sell her product, set the stage for future box themes and create a one-of-a-kind experience for her customers. 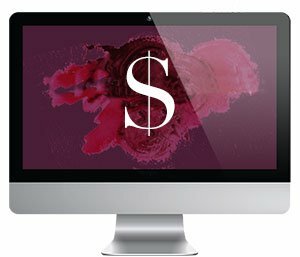 Then, we designed the website around her goals of growing her e-mail list and selling her product, all while promoting the benefits of the product and the experience one has with it. Overall, this project has spanned over two years and I can truly say that there’s no one else I’d rather work with for that length of time. I’m proud that Kristine is not only my client, but someone I consider a true friend. She inspires me in more ways than I could ever articulate, and I can’t wait to see how this product flourishes now and into the future. 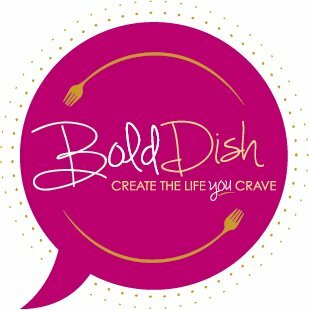 If you crave more connection with your friends, and wouldn’t mind eating some tasty treats too, do yourself a favor and host a dinner party using Bold Dish’s Dinner Party in a Box. You’ll be glad you did!